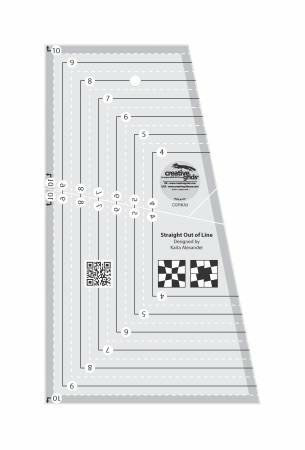 The Straight out of line ruler creates unique four patch blocks with the illusion of curves. Ruler markings make it possible to cut squares - 4" - 10" squares and every half inch in-between. The finished size of the pieced blocks is approximately 3/4" less than the size of the cut blocks. The ruler slides easily over the fabric until pressure is applied, then the exclusive gripper holds the ruler in place while cutting, eliminating slipping and miss cuts. It comes with fully illustrated step by step instructions or you can scan the QR code printed on the ruler to view a video demonstration.